Are you looking for tennis training ideas and exercises to help you on the court? From workouts to tennis exercise tips for footwork as well as overall strength, let us provide the tips and support. Being a sport that requires many physical requirements, such as good flexibility, co-ordination, aerobic fitness, strength and a good mental ability, there is obviously a lot of room for improvement in most players of any racket sport. The main racket sports are Tennis, Squash, Racquetball and Badminton. They are all similar in the fact that they require the same physical training. When you play you're chosen racket sport, analysis each point you win and lose, with a number of different players to find your strength and weaknesses. Work on improving all areas, however start with the ones that you are weak on, in order to improve your game quickly. Lets remember to get fit to play sport, not play sport to get fit, this way, we will enjoy the game more, and reduce the risk of injury. 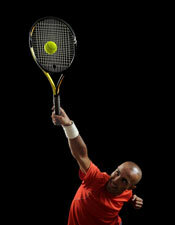 You can also check out our racquet training, some additional fitness training and exercise programs advice.